Pasta Fagioli or Pasta with Beans is an Italian comfort food. 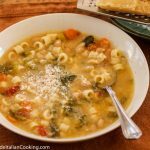 The proper name is Pasta e Fagioli, and it is categorized as a soup instead of a pasta. It is often served as an alternative to meat. Southern Italians call it Pasta Fazool. This is a white, creamy version with white northern beans, a small diced potato and a small amount of Ditalini pasta added to the chicken broth. Serve lots of freshly grated parmesan cheese and extra cooked Ditalini ion the side. red pepper flakes ½ tsp. Cover bottom of dutch oven or large pot with olive oil. Saute garlic in olive oil over medium high heat for 1 minute. Add the onions, celery and carrots, stir a minute or two, then add the potatoes. Stir the potatoes to incorporate with the vegetables. Stir in the salt, pepper, rosemary and red pepper. When the vegetables are glistening after a few minutes, pour in the broth. When the broth starts to simmer, add the tomato and beans. Simmer 20 minutes. Scoop out 1 and 1/2 cup of the soft vegetables and blend in a blender or chopper, then re-add to the pot and stir. Simmer 10 minutes, stir a few times. Next, turn up heat to bring to a light boil and add the ½ cup uncooked pasta. Stir the pasta a few times so it does not stick to the bottom. After the pasta is cooked - about 10 minutes, add the escarole. Let this slow simmer for 30 minutes or longer. The broth should not be too watery. Add ¼ cup grated parmesan in pot and stir. Serve with grated parmesan cheese on top of each bowl. If desired add more pasta. Tastes even better the next day.